The telecom world is going All-IP. Meanwhile, service providers must select network-access technologies—based on price, bandwidth, and geographic coverage—for their evolving SME offerings. 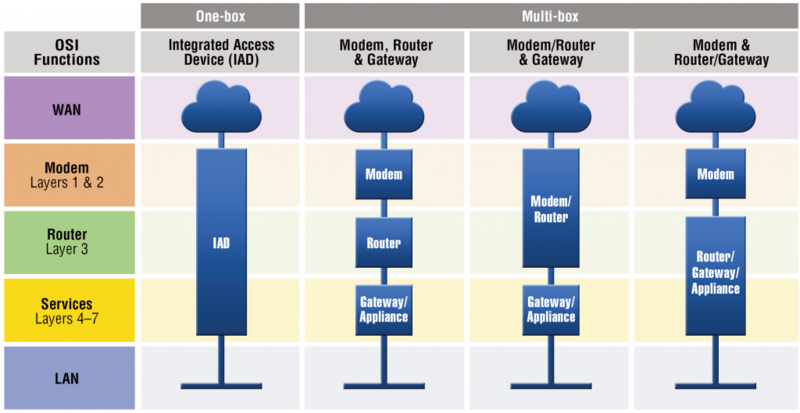 For customer premises equipment, multi-box (modem + router + gateway) and single-box (IAD) solutions must be evaluated. So, what are the pros and cons? 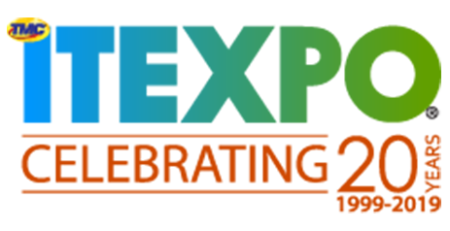 The telecom world is going All-IP. Such aspects as service quality, security, and reliability are under heavy scrutiny. Equipment vendors, service providers, and consultants are developing and promoting solutions to these open and ever-evolving challenges. This article explores the topic from the perspective of service providers making crucial decisions about physical and functional network architectures on the customer premises. The available options for this architecture have a far-reaching impact on the logistics, flexibility and technological risks of All-IP deployments as well as the business plan for the venture. Figure 1 provides a visual overview of the options for CPE architecture, shown as a set of schematic diagrams. There are essentially two basic approaches to the question of CPE architecture: one-box and multi-box. The one-box solution integrates as many functions as possible into a single device. Such a device is commonly known as an Integrated Access Device (IAD). 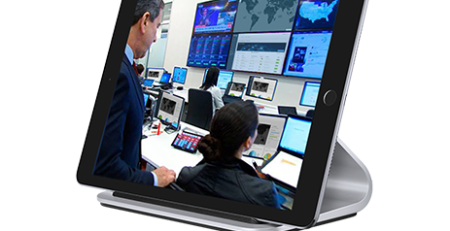 This means L1/2 transmission technology, L3/4 routing and security features, as well as higher layer service functions such as media gateways and signaling, are built into the same box. 1. 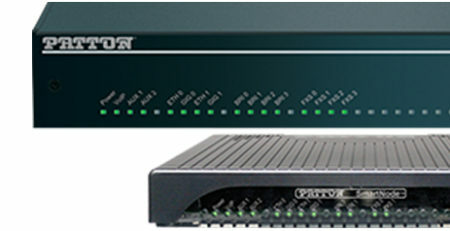 Include a router and transmission modem in one box, and provide a dedicated VoIP media gateway or eSBC in a second box. 2. 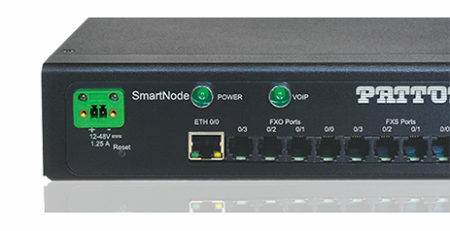 Box one provides a simple transmission modem (acting as a bridge), while box two combines Layer-3 routing, QoS and security functions, and media-gateway or eSBC functions. 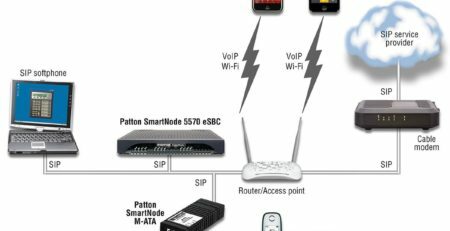 To learn more about Patton solutions, contact the 888VoIP team at 888-864-7786 or view our Patton product offerings. About the Author: Ramon Felder, Business Development Executive, Patton-Inalp Networks. Ramon Felder is the business development executive for Patton-Inalp Networks in Switzerland. 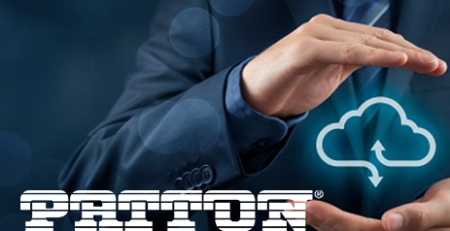 Previously, he has served Patton-Inalp over 18 years in different roles as CEO, COO, and product manager. Mr. Felder graduated in 1996 from the Swiss Federal Institute of Technology in Lausanne and holds a Master degree in Business Administration from the University of Rochester.